It can seem stressful to find a reliable roofing company, especially when it’s a commercial roofing specialist that you need. Fortunately, building owners in the Parkersburg, OH, area can rely on the expert services of E&E Construction Company to attend to their commercial roofs. Among the specialty services we provide at E&E, we offer spray foam roofing services, otherwise known as spray polyurethane foam or SPF. 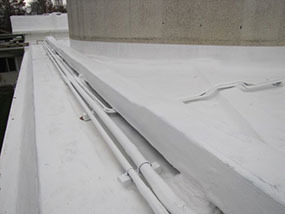 Spray foam roofing is an outstanding product that offers a variety of benefits. For all of your roofing needs, big and small, you can count on the expertise of the E&E Construction crew. Give us a call today, (740) 331-0695, to schedule a free consultation! Incredible insulation value of R6.5 per inch, which is the very highest you can get! 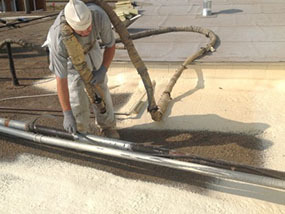 When the E&E Construction team tackles a spray foam roofing job, the application process involves utilizing a spray gun. This specialized gun mixes two liquid components that combine to form the rigid polyurethane foam, which is impressively lightweight and can be applied over top of most existing roofing systems. The application of this foam does not significantly add weight to the roof, so a roof’s problems can be addressed and the roof structure strengthened without surpassing its structural load capacity. As the SPF product is applied, our technicians will address all of your roof’s problem areas one at a time, repairing and resealing them. The entire roof is then sealed with a reflective finish coat. Because SPF roofing is incredibly strong, it can stand up to foot traffic and other added weight, making it an all-around excellent roofing solution. High-quality insulation and exceptional protection are added bonuses, and the final result is a strong roof and a building that is well-protected. To learn more about spray foam roofing, give the E&E Construction team a call at (740) 331-0695. We can schedule a free consultation and visit your building in person to assess the condition of your roof. We will then provide you with our recommendations for repair and an accurate estimate for the work to be done.